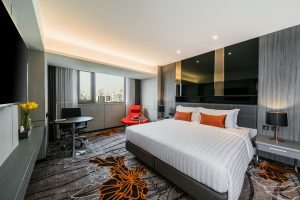 Welcoming guests from 19 March 2019, 17-story Hotel Verve stands adjacent BTS Sky Train and comprises more than 300 strikingly contemporary guest rooms. 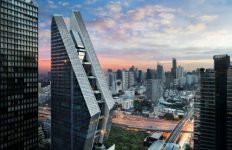 The hotel’s combination of facilities – during pre-opening phase including all-day-dining restaurant but with much more to come – likewise sets it apart from other accommodation choices not only in Thong Lo but indeed all of Bangkok. 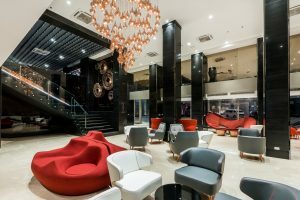 Hotel Verve by Grand Tower Enterprise Co., Ltd. represents the rebranding and thorough renovation of Grand Tower Inn, for decades a favorite among international visitors to Bangkok, as have been the company’s other downtown Bangkok hotel properties. 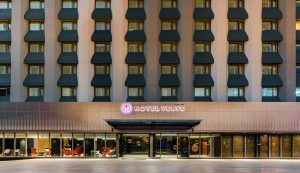 At Hotel Verve, certainly remaining a constant is the operator’s commitment to providing outstanding accommodation at excellent value. Those aims come together in a big way at Hotel Verve. And though a mid-sized hotel by comparison, Hotel Verve makes the most of well-considered facilities for a memorable stay. In addition to stylish and thoughtfully appointed guest rooms, available now is cozy all-day-dining venue S-SEN featuring one of the city’s most renowned breakfast services, unique lunch that ‘fits your style’, afternoon delights and stylish dinner gatherings. In coming weeks and months, guests likewise will enjoy: rooftop indoor/outdoor onsen, loft-style co-working area, well-equipped meeting spaces ideal for small and informal gatherings, 24-hour fitness facility, and premium yakiniku restaurant. A striking new look retains elements of the hotel’s heritage yet within a fully updated environment. Architects and designers have taken inspiration from Japanese architectural and interior components as well as other Asian motifs to create a more open setting complementing Hotel Verve’s already soothing atmosphere. 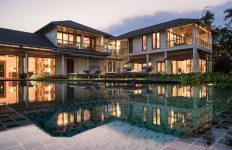 New focal points include pebble gardens, interior flowing water features, wall murals depicting mountain vistas and sun-ray scenes, along with beguiling art objects such as raindrop-shaped lamps. Extensive hotel facilities allow for the kind of comfort and convenience with guests’ needs as utmost importance. All-day-dining restaurant S-SEN Brasserie & More on the hotel’s second floor serves international cuisine for breakfast, lunch and dinner in a stylish yet relaxed ambience. Further enhancing Hotel Verve’s food and drink reputation is the collaboration with Ginzado premium yakiniku restaurant at hotel’s lobby-level every day from 9 a.m. until midnight. Similarly high above the city is Hotel Verve’s 16th-floor fitness facility providing essential exercise equipment in addition to inspiring views out floor-to-ceiling windows. Open every day (24/7 days). There are two meeting rooms configurable for business gatherings and small-scale conferences. Both rooms are on the hotel’s third floor. Verve Meeting I at 86 square meters provides seating for 34 persons in a boardroom configuration, while Verve Meeting II at 28 square meters can accommodate 12 persons within a boardroom layout. And it’s now all coming together, in just the right size, at Hotel Verve. Adding to just that kind of pre-arrival enthusiasm is a special opening rate on accommodation at Hotel Verve with savings of up to 30%. Guests can book online at www.hotelvervebangkok.com using the promotional code “HVIP”. Booking period for opening rate is now to 30 June 2019 with stay period now to 31 July 2019.